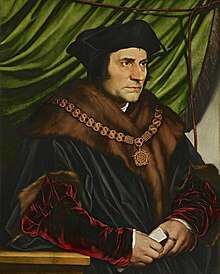 Sir Thomas More (/ˈmɔːr/; 7 Februar 1478 – 6 Julie 1535), veneratit bi Catholics as Saunt Thomas More, wis an Inglis lawyer, social filosofer, author, statesman an notit Renaissance humanist. ↑ Homily at the Canonization of St. Thomas More at The Center for Thomas More Studies at the University of Dallas, 2010, citing text "Recorded in The Tablet, June 1, 1935, pp. 694–695"
This page wis last eeditit on 25 Februar 2018, at 00:25.